A leading U.S. terrorism expert has warned of renewed tensions between the Muslim world and Denmark in connection with plans by Jyllands-Postens Culture Editor Flemming Rose to release a book in which caricatures of the Prophet Mohammed are reprinted. In his ‘The tyranny of silence’ Rose studies the 12 controversial caricatures of the Prophet Mohammed, which were first published in Jyllands-Posten in 2005. Since then, they have repeatedly been re-printed in media across the world and caused anti-Danish demonstrations, boycotts of Danish goods in Muslim countries, the burning of Danish flags and torching of Danish embassies in Damascus and Beirut. “If I were him, I would seriously consider the consequences of reprinting the drawings,” says U.S. terrorism expert Evan Kohlman, who has worked for the FBI and the U.S. administration on terrorism issues. Kohlman says that while he understands the issue of freedom of speech, ‘every time the drawings are reprinted, there are riots and demonstrations and there will be bloodshed’. The spokesman for the Islamic Society in Denmark Imran Shah says that Flemming Rose is ‘beyond reach’ and says that Danish Muslims will probably react by shrugging their shoulders. 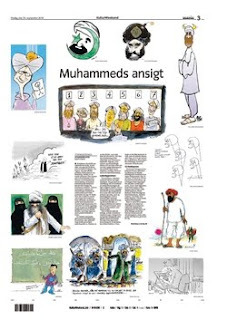 The author insisted in an interview with Jylland-Posten competitor Politiken that he was not trying to be provocative, stressing that he simply wanted to "tell the story of the 12 drawings and put them into a context of (other) pictures considered offensive." "I am sure that a lot of people don't know what I think of these drawings. My concerted wish is to explain myself. I have nothing but words to do so, but once people have read the book ... maybe they will be able to see the broader context," he said. "Words should be answered with words," he said, explaining why it had been so important for him to write the book. Opinion: Do moderate Muslims exist?